Title/Author: Monstermatt's Bad Monster Jokes. (Volume #1) by Monstermatt Patterson. Wow. This is...bad. Just bad. I mean, even the author admits they're bad. He screams it proudly and advertises it in the title. What kind of gimmick is that? Well, for one thing, it's not a gimmick. It's just the author showing his humor and honesty. I find the concept of writing and embracing a book of bad jokes endearing. However, I didn't find the jokes really thaaaat bad. Cheezy? Yes. Silly? Definitely. Corny? Absolutely! But how charming and fun. This tome is not trying to be anything that it's not. It's just jokes, riddles and songs that you can't help but smile over (and groan a little too). The one thing that really tickled me, so to speak, is that my dad would have LOVED this book. He was the king of corny jokes. I usually don't read these kind of books, but it is easy enough to peruse through it during commercials or waiting for water to boil. The introduction had me giggling. The illustrations had me smiling. The jokes had me grinning. A lovely, fun tribute to monsters for monsters of any age! 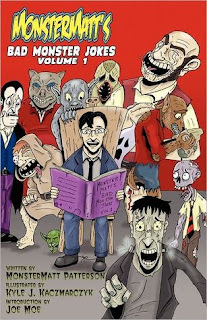 Look for Monstermatt at Horrornews.net and Zombie Ink Comics. This book was given in exchange for an honest review. Please see my review policy. Ha! That sounds like a fun read. I'm always using corny jokes on my blog for my giveaways - this could be useful for when Halloween rolls around. LOL...this sounds like great book to keep on the bar.